Culture is defined as “values, beliefs, attitudes, and behaviors that employees share and exhibit on a daily basis in their work and in the community”. And, lack of cultural fit is among the top reasons physicians leave a practice – even more than compensation. Many practice executives and recruiters can attest to the challenge of recruiting into an organization with a dysfunctional culture. It doesn’t work! On the other hand, some organizations have earned a reputation for a healthy culture that supports physician retention, which is key to successful recruitment. By establishing trust and maintaining transparency, from top leadership through the entire organization, they have created an environment that supports faster fills, shorter vacancies, lower turnover and a measurable return on investment. More and more studies are proving the correlation between culture, performance, and growth. 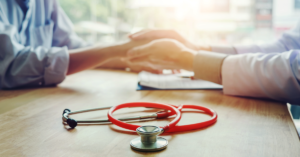 Gallup research shows a direct link between employees’ understanding of their organization’s purpose and culture, and important performance metrics that are critical in healthcare. For example, nearly every healthcare organization says: “We are mission-driven.” It may be the most common catch-phrase in healthcare! But Gallup found that an average of only 40% of employees feel that “their job is important to their organization’s mission,” a key predictor of employee and team performance. They also found that performance improves in organizations where 80% feel their jobs are important. Simply stating the goal of building a “healthy culture” is not enough. It requires a blueprint. Just like building a clinic or hospital, you need to be sure everyone is following the same vision, understands the standards and can measure all the materials and supplies precisely so it both looks and functions as you envision. Building a culture is the same way — you need a vision, a plan to follow and a way to measure it. So, whether you call it a blueprint, a framework or a foundation, start by thinking of culture as an intentional way to demonstrate the attributes that are vital to your mission and important to your team. Doing so will differentiate your organization in the marketplace and clarify how well your culture fits the motivations and personal needs of physicians and advanced practice providers you seek to hire. Becoming known as a genuine “great place to work” will accelerate recruitment and foster retention over the long-term. To learn more about the how to evaluate how your culture fits with physicians and advanced practice providers you want to recruit, contact us. 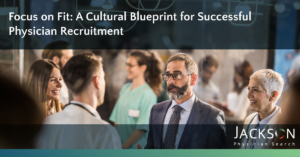 This presentation, given by our CEO at the 2018 MGMA Annual Meeting, explains why cultural fit is so important and how to create a physician recruitment blueprint that focuses on fit.